This module covers recursion, a powerful technique in programming. You should already be familiar with loops and have some practice programming with them. If we now call recurse(0), the function will repeatedly call itself, printing higher numbers each time. It would go on forever like an infinite loop, except the computer runs out of resources and it causes a StackOverflow Error. We can now call recurse(0) and it will print the numbers from 0 to 9. Question: That's just like the loop before, what's the point of recursion? Notice that the Factorial of a number is simply equal to that number multiplied by factorial of the number below it. For example 5! = 5*4! and 4! = 4*3!. We can now call factorial of positive integers and it will return the correct answer. For example, let's call factorial(5). so the function finally returns 120 for factorial(5). You can try the visual Java debugger to see the Factorial Function Visualized. In summary, since the factorial function can be defined recursively ( N! = N * (N-1)! ) it can be coded recursively in the same way. Instead of returning a simple variable, the function calls itself (with a new parameter) and returns the result of that. 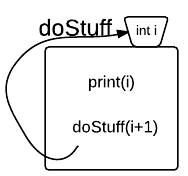 It's essential to define a "base case" so the function can eventually exit the loop and return the results back up "the stack". Question: Couldn't the factorial function also be written with a loop instead of a recursive function? Answer: Yes, but the code wouldn't be as clean, since you would need to create an extra variable. Recursion lets you write better code, and you'll see it's real power in the next page. Practice Recursion with the challenge below. For extra credit, go to Loopy practice and rewrite the basic math functions using Recursion instead of loops. What will happen when you call factorial(4), passing 4 to the above function? decrease(7) calls the method below. What will it print? You will be given a positive integer a. Fill in the method doStuff so that it adds up all the positive integers up to a and returns the sum. For example, when given 4 it should return 10 (4+3+2+1). While there are other ways to solve this challenge, you should use recursion to get the sum. i have tried to compile this on my dev C++ and it works ..